This is the second part of a two-part article on French airpower in current contingencies. For a country like France, the strategic context in the short- to mid-term will probably be the continuation of the current era of protracted interventions, necessary but unfortunately non-decisive, in Africa (as leading nation) and the Middle East (as part of US-led coalitions) in order to contain jihadist entities which flourish in the breeding ground of deep and long-term political disaffection. Concurrently, the two terrorist attacks perpetrated by jihadists in January and November 2015 led to a standing redeployment of forces, particularly ground troops, in the Homeland, for political purposes rather than for any strategic rationale. At the same time, France has to contribute to a renewed reassurance mission against a resurgent Russia. Such context will evolve: it may worsen with further destabilization and/or the buildup of new regional stability mechanisms hostile to our interests. Within such a context, as we developed in the first part of this post, expeditionary ground capabilities are shrinking and/or cannot be deployed due to the political context, thus putting the emphasis on the need for airpower which has to be not only effective but also available. Capability. On the one hand, there are standing capabilities limitations in the high-end spectrum of operations. European airpowers are unable to operate alone in a strong anti-access/area-denial (A2/AD) environment for very long without US assistance. Modernization with “generation 4.5” (Rafale, Gripen, Typhoon) and “generation 5” (F-35) fighters as well as cruise missiles will alleviate but not eliminate this shortfall because threats will continue to evolve and because European states cannot afford to field the full range of enabling capabilities including electronic attack, penetrating airborne ISR, and robust C2. At a time of austere budgets, maintaining the skills for such operations through adequate training is also a formidable challenge. Yet this high-end operating threshold may be rapidly reached in the current strategic context, as demonstrated by the aborted airstrikes against the Russian-backed Bashar al-Asad regime, and its formidable integrated air defense system, in 2013. Nevertheless, this limitation should be placed in perspective by the fact that most engagements against state adversaries armed with such A2/AD capabilities would almost certainly be undertaken by a US-led coalition. European forces would only complement USAF and USN airpower. Capacity. On the other hand, capabilities always prevail over capacity in force development programs. European airpower modernization has systematically favored the acquisition of the most sophisticated capabilities at the expense of force structure. For example, the French air combat force will shrink from 300 fighters in 2013 to 225 within ten years. Of course, new generation fighters have or will have better capabilities and flexibility than previous ones. Rafale is able to handle functions which previously required several Mirage 2000. For sure, the rationale favoring advanced capabilities is sound when contemplating high-intensity operations. It may be relevant for European powers which are reluctant to intervene in lower-tier operations. 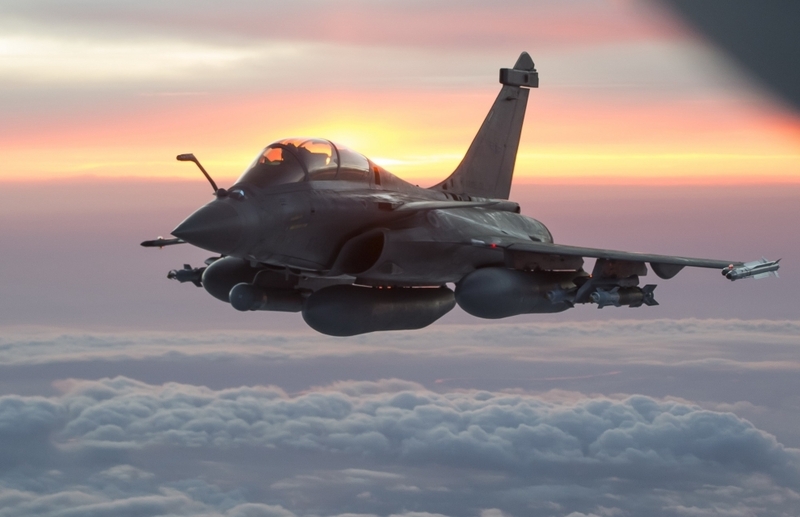 However, for France and some others which are engaged or may find themselves engaged on simultaneous theaters, the trend is clearly counterproductive, especially as in most of these theaters current systems such as Rafale clearly provide overcapacity against the adversaries at hand. Despite regular claims to the contrary, non-state adversaries remain limited to relatively low levels in terms of infrastructure and skills which prevent them from getting so-called “hybrid capabilities.” The only example of such achievement remains Lebanese Hezbollah which has fielded armed drones and other sophisticated means, but only with Iranian support. A resolution to this posture problem would require a reassessment of European capabilities development which would prove very difficult for government institutions. In this time of harsh budget constraints, planners tend to “circle the wagons” around key current programs and do not want to give up what they have (or expect) to uncertain alternatives. This is fully understandable, but it confines to the margins many broader perspectives and potential different paths. Below is a rapid overview of the programmatic issues for ISR, air mobility, and force application functions raised by the current strategic context. Intelligence, surveillance, and reconnaissance (ISR) is clearly an absolute priority of recent years as the French military has suffered important capabilities shortfalls in this area. These shortfalls do not concern space reconnaissance: Pleiades satellites provide high-quality imagery and are operated through very dynamic tasking and processing procedures, so they are doing much more than simply complementing Helios systems. By contrast, airborne ISR capabilities are provided by only a few dedicated manned assets: only two Gabriel C-160 NG SIGINT aircraft and several of the Navy’s 15 Atlantique 2 maritime patrol aircraft are well suited for battlefield surveillance. The French military therefore praises the MQ-9 Reaper remotely-piloted aircraft (RPA) which has been implemented progressively by the Air Force, outclassing old Harfang systems in all respects: endurance, speed, sensor quality, etc. Twelve medium-altitude long-endurance (MALE) aircraft are covered by the 2013 Military Programming Act (LPM). To complement these scarce means, the Air Force and intelligence services are deploying light ISR aircraft, sometimes contracted with commercial firms. The Army should have replaced its aging tactical RPAs with 14 new platforms, either the Sagem Patroller or the Thalès Watchkeeper. Today, ISR also constitutes one of the most important tasks performed by fighters (non-traditional ISR or “NTISR”) through the very effective Reco NG pod or their navigation/targeting pod, though the latter is designed for deliberate targeting and has insufficient discrimination performance against small targets. Broadly speaking, efforts are well underway to adapt air and space ISR for current engagements, from both capabilities and capacity perspectives, even though many issues remain such as wide-area sensors on RPAs and NTISR pods limitations on fighters. Air mobility, even more than ISR, is in a critical situation. The Airbus A330 Multi Role Tanker Transport (MRTT) has been long-awaited to relieve a geriatric and exhausted fleet of C-135 tankers, but delivery will not occur until the end of the decade. Plagued with delays, Airbus A400M has been ordered in only small numbers: only 13 aircraft in 2019. Nevertheless, the A400M fleet outstandingly expands airlift capabilities otherwise limited to a shrinking inventory of 60 very old C-160 Transall, C-130 Hercules with poor availability, and more modern lighter CN 235 (nicknamed “Transalito”). While recovery of air mobility capabilities is an imperative, this strategy will reconstitute the airlift fleet around a “one size fits all” solution: both mid-strategic (unable to transport heavy equipment such as tanks, self-propelled artillery, etc.) and mid-tactical (very inefficient when dealing with numerous small intra-theater missions). 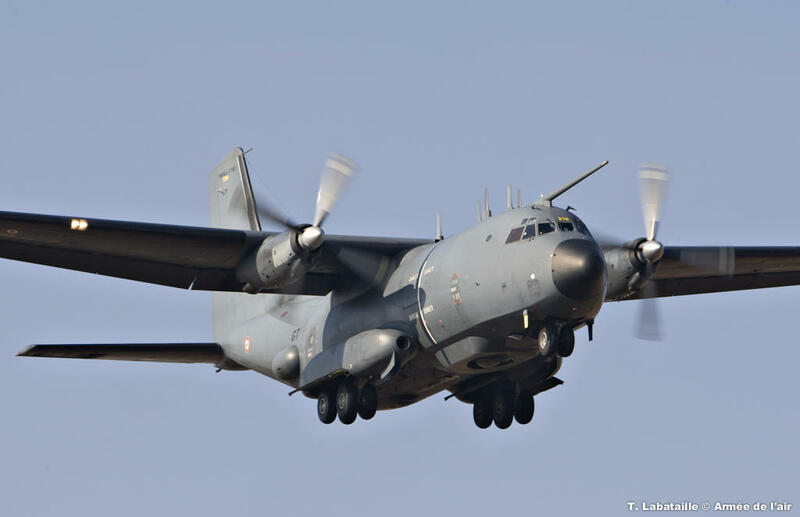 A more efficient solution might consist of more CN 235 purchases as a complement to a reduced A400M fleet, but the industrial and multinational cooperation equities represented by the latter program make such a rebalancing option uneasy. The story is quite similar regarding helicopters. The effective yet costly NH-90 Caiman utility helicopter is replacing the outdated Puma in Army aviation regiments, but French forces remain one of the only western militaries which do not operate heavy transport helicopters (HTH). HTH is typically the kind of asset which falls prey to the “circle the wagons” syndrome: everybody acknowledges its tremendous value-added, but the launching of such a program always lags behind current priorities. 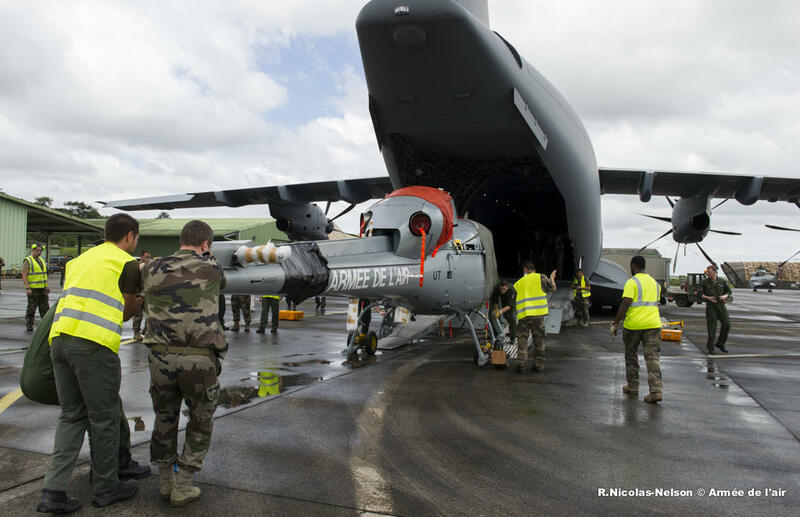 Force application may currently be the strongest element of French airpower, but it should represent the biggest area of concern over the long term. 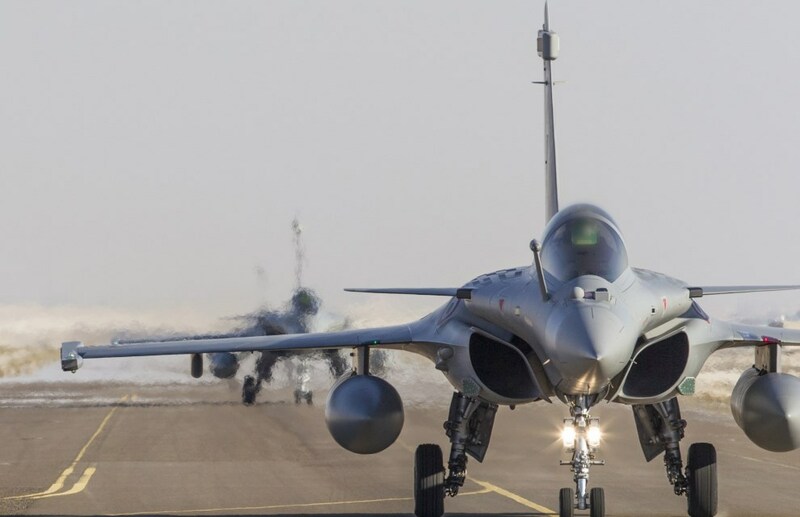 The 2013 Defense Review determined that circa 2025 combat airpower will rely on 225 fighters (135 multi-mission Rafale and 50 modernized Mirage 2000D for the Air Force, 40 Rafale for the Navy) and must be able to operate either 45 fighters for one high-intensity coalition operation or around 15 fighters in three protracted “crisis management” low-to-medium intensity operations. Currently, the French Air Force is fully committed to operate and sustain around 12 Rafale and Mirage 2000 D/N as part of the coalition against the Islamic State in Iraq and the Levant (ISIL) and six fighters as part of the BARKHANE campaign in the Sahel region of Africa, primarily used for NTISR. The Charles de Gaulle aircraft carrier can provide a very strong supplement (or even more) to these capabilities as demonstrated by its current wing of 26 Rafale and Super Etendard Modernisés which is executing airstrikes against ISIL. However, this is a “surge” capacity, only intermittent, which is to last four to six months at best. This over-commitment is sustained at the expense of readiness, which does not exceed 50% even though streamlined procedures are improving it in the Rafale fleet. At present, this component, totaling about 280 aircraft, has yet to shrink significantly with the phasing out of nearly 100 Mirage 2000 and Navy Super Etendard Modernisés, as it will be somewhat offset by the commissioning of 40 new Rafale. The situation is even more problematic for Army aviation, though, which provides critical support for conventional and special forces: its inventory is eroding from nearly 300 reconnaissance and attack helicopters in 2010 to a planned 140 platforms by the middle of the next decade. For sure, the discrepancy of capabilities between Tigre, among the best attack helicopters in the world, and the venerable light Gazelle helicopter it replaces is even more remarkable than for Rafale vs. Mirage, but there will be probably never be more than 80 Tigre and even ten years after reaching initial operational capability status, it displays one the lowest availability rates among French combat air systems. So, fixed-wing combat airpower will consist of an almost all-Rafale force, able to deliver a wide range of weapons to tune desired effects, and well-complemented by SCALP cruise missiles. This force will still be severely challenged in a strong A2/AD environment, and the simple arithmetic makes clear that in a couple of years, the French Air Force will no longer be able to sustain its current operational tempo. 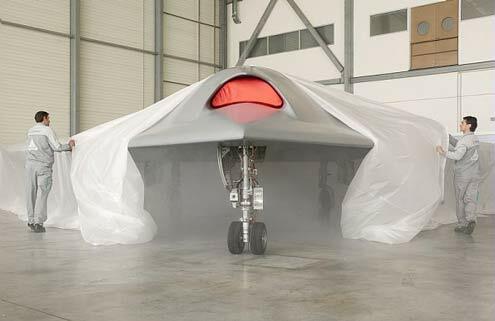 To deal with the former challenge, France is experimenting with unmanned combat air systems (UCAS) with several partners (nEURon) and launched a study with the UK for a Future Combat Air System (FCAS). While it is too early to have a clear view about the performance and cost of this FCAS, known estimates of the US Navy UCLASS – ranging from $3.7 to $4.9 billion for an initial capability of 6 to 24 aircraft – indicate the acquisition costs of such systems would be at least equivalent to a “5th generation” fighter program. A country like France could probably support it financially, but only as a substitute, not a complement, to other tactical aircraft programs, resulting in further depletion of the force structure and aggravating the latter challenge even more. Besides, several studies – as well as US Navy force development – point out the diminishing value of stealth against adversary detection apparatus based on new optical sensors and/or low frequency radars. Rather than following this ruinous UCAS pathway, it might be wise to consider some kind of more affordable “offset strategy” including manned-unmanned teaming using smaller drones and/or cyber-attack payloads. To deal with the more pressing capacity challenge over the mid-term, armed RPAs, not only MALE but also tactical RPAS, would be the evident solution to consolidate an efficient dynamic targeting and close air support capability in the permissive theaters which represent the bulk of French engagements. It should be noted that such an armed RPA capability, already demonstrated by the US, UK and Israel, will be implemented by 20 countries by the end of the decade. For France and other European countries, armed RPA development is hampered by a mix of reasons ranging from the irrational but real political sensitivities outside the military concerning these systems to the priority given to manned programs within the military. While “this makes sense” for the French Air Force according to its new Chief of Staff, nothing is yet decided: the option has not been mentioned in the defense review (except for remote UCAS) and neither the next Army tactical RPAs nor, seemingly, the MALE 2020 program (launched this year in cooperation with Germany and Italy) are so far scheduled to be armed. To conclude, the mid-term strategic context would require European airpowers, and especially France, to rebalance their capacity vs. capabilities tradeoff to maintain sufficient means to continue to provide invaluable air support in simultaneous theaters of operations. Over the longer term, European budget caps make the current modernization strategy a stalemate: the horizon of Augustine’s famous 16th Law is far closer for European air forces than for their US counterparts. Dealing with both challenges would require an in-depth reassessment of the ways and means of European warfighting functions, particularly the nexus between force application and ISR. Until now, current capability development has been framed narrowly by a budget offering little-to-no margin for maneuver, making a reassessment possible only for long-term planning beyond the mid-term programmatic horizon. Nevertheless, the war situation triggered by the November attacks, the bloodiest terrorist incident in French history, now recognized by the government and assimilated by public opinion, compels our authorities to speed up this reorientation. Philippe Gros is a research fellow at the Fondation pour la Recherche Stratégique, a Paris-based think tank dedicated to defense and security matters. He works mainly on forms of military engagements, military concepts and capabilities, primarily related to airpower, and on US defense policy. He was previously a concept/doctrine developer at the French Ministry of Defense.